Simple design yet is a very powerful blender. 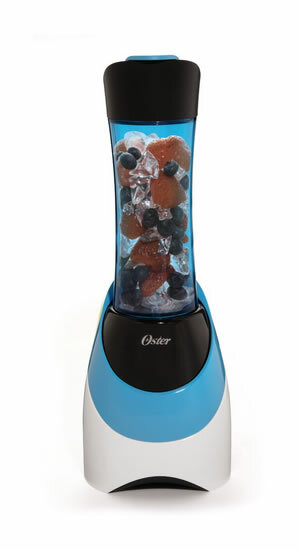 I use the Oster My Blend for smoothies that include fruit, vegetables, and ice, and it still only needs seconds to achieve a nice consistency. If you’re searching for an on-the-go blender… this is certain to be it. I might order more bottles later so I can prepare more smoothies in the morning. This really is an affordable and truly amazing blender. I can’t believe how useful these little blenders are. Plus, it is compact in size and easy to clean. My Blend is a truly great blender for the price. I wanted a personal on-the-go blender to make breakfast smoothies and coffee, and I believe the Oster My Blend series is the most convenient option. While it isn’t anything fancy, this blender has been perfect for the purposes that I’ve needed it. It’s a reliable choice to mix my smoothies, grind my coffee beans, and combine butter with my coffee. I love the sport-inspired attachment and this makes it really user-friendly and I’m able to take the bottle with me rather than using a separate cup. I regally make fruit smoothies and this is finely liquefied to make it possible to sip from the bottle without concerns of large chunks. All I need is a one cup serving and in my opinion the My Blend travel bottle is perfect. The only complaint I have with this Oster blender is the slow process in making smoothies with ice or frozen fruit. It can take slightly longer than other appliances to blend down the more solid ingredients. I’ve attempted to make a smoothie with frozen chocolate and fruit and was still left with sizable chunks. So, for a quicker performance with this blender, make sure to pour in fresh fruits and ingredients. My Blend isn’t a high-performance model so don’t expect to pour in solid or dense ingredients and get perfect results. Use it to create simple shakes and smoothies and up-grade to a bigger blender if planning to pour in mostly frozen ingredients. The Oster My Blend is a great on-the-go blender. Cute bottle; crushes ice, easy to use, and easy to clean up. It’s so nice to not use a full-size blender in the mornings. The Oster BLSTPB-WBL My Blend on-the-go blender has a List Price of $39.99 and Best Price of $19.95 (price subject to change). This is a very affordable price to help add healthy and green smoothies to the dietary intake.